I’m currently being kept pretty busy by the Biennial, but before that I’d wanted to take a bit of time to think. That time was necessary after the events of Thursday 23rd June – and more specifically, the reactions to it. Whatever your views on what happened on Brexit, social media indisputably had a bit of a meltdown. Whether people were devastated or elated, things got nasty pretty quickly. People were making barbs at the other side; big sweeping statements with little evidence to back them up. The Internet’s feedback loops were swinging into action – the more emotive other people get, the more emotive you get. This is still carrying on now, with reactions to Theresa May’s Premiership, Jeremy Corbyn’s struggles, and Boris Johnson…well, being Boris. Don’t get me wrong: these are major changes which affect all of us (even if you don’t realise it yet). They are things that people should have opinions on, including angry ones. But I personally felt that the un-directed anger was drawing me away from thinking about what, if anything, I should do about it. So I stepped back. I’m telling you all this not because of a need to talk about politics (I feel a bit exhausted on that subject), but to give you some context as to why I’ve had this picture floating around my head recently. 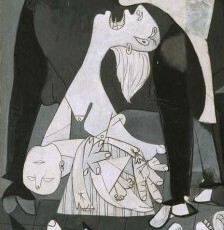 Pablo Picasso, Guernica, 1937. Picture courtesy of Museo Reina Sofia, Madrid. …But let’s get a bit of perspective here, shall we? On 26th April 1937 the Germans bombed the Basque town of Guernica, on market day, killing mostly women and children (the men were mostly fighting in the Spanish Civil War or working in the factory outside the town, which was not bombed). Picasso saw photographs in the newspapers, and they affected him in a big way. So much so that when he was commissioned to paint for the Spanish Pavilion of the International Exposition in Paris in 1937, this is what he chose as his subject. To give this situation a voice. painting is huge (3.5 x 7.8 metres) and the overall effect is one of utter chaos. I actually started drafting this piece a couple of weeks ago but then, for various reasons, abandoned it. But last night (14th July), there was an attack in Nice which was so barbaric as to be beyond reasonable comprehension. And this felt relevant to me again because it’s another example of the kind of inhumanity which Guernica is really responding to. So to use Guernica as a metaphor for Brexit is trite. I’m not saying that politics isn’t important, and there are plenty of places in art to talk about that too. But our situation in the UK does not warrant the levels of panic seen here, and the apocalyptic mood the Internet has been in. Let’s use a great piece of art to remind ourselves that things could be a lot, lot worse. This entry was posted in Home, Let's Talk About It and tagged art, Brexit, Guernica, Picasso, tragedy. Bookmark the permalink.